The 38th regular session of the Human Rights Council (HRC) was officially opened on 18th June 2018 by H.E. Ambassador Vojislav Šuc, Permanent Representative of Slovenia to the United Nations Office at Geneva (UNOG) and HRC President. After which the UN High Commissioner for Human Rights, Zeid Ra’ad Al Hussein, gave the oral update on the situation of human rights worldwide and on the activities of the Office of the High Commissioner for Human Rights (OHCHR). 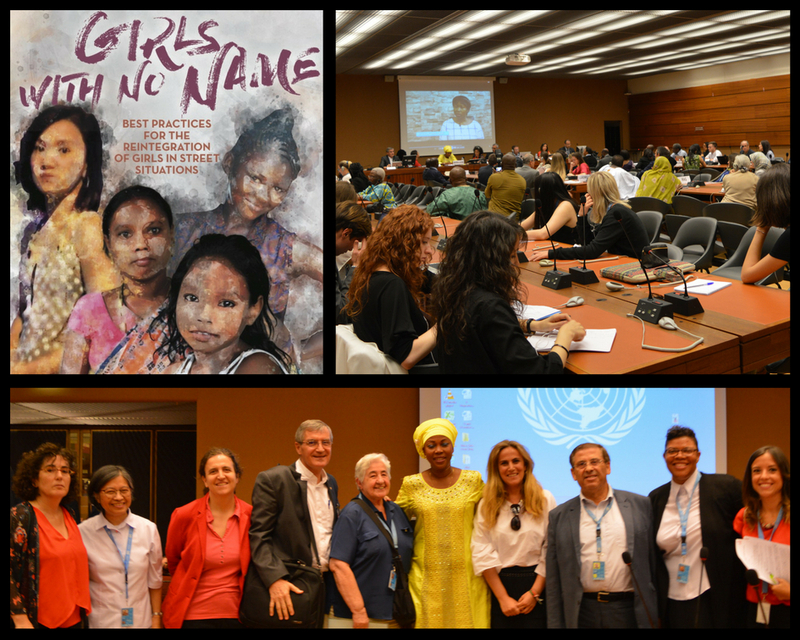 22nd June was an important day for IIMA, Istituto Internazionale Maria Ausiliatrice, VIDES International, the Don Bosco Fambul Center of Sierra Leone, Misiones Salesianas, Don Bosco Jugendhilfe Weltweit, and the Permanent Mission of Italy, organizers of the side event on “Girls with no name – best practices for the reintegration of girls in street situation”. Besides the Permanent Mission of Italy, the event was also co-sponsored by the Permanent Missions of Sierra Leone, Montenegro, Honduras, Philippines, Paraguay, Spain, Colombia, the European Union Delegation, and the UN OHCHR. H.E. Massimo Bellelli, the Permanent Representative of Italy to the UNOG, in his opening remarks at the side event, introduced the sensitive issue of children in street situations, emphasizing Italy’s commitment to addressing such phenomenon. This was followed by the projection of a moving video message of Augusta Ngombu – Gboli, a girl in street situations in Sierra Leone, who was forced into prostitution as a child when she became orphaned of both parents, and who was later redeemed thanks to the intervention of the Salesians at the Salesian mission of Don Bosco Fambul. Here she found a home, regained her dignity and acquired a voice. Today, this brave young woman fights for the cause of girls, who like her, are victims of prostitution. The side event was moderated by Ms. Imma Guerras – Delgado, Team Leader for the Rights of the Child and of Youth at the OHCHR. Then Fr. Jorge Crisafulli, SDB, director of Don Bosco Fambul in Sierra Leone, shared his experience at the Don Bosco Shelter which welcomes girls in street situations and those forced into prostitution due to extreme poverty. Today, there are more than 1,500 girls in this condition at Freetown. Since 2016, thanks to the intervention of the Salesians of Don Bosco, 163 young women abandoned the streets and were reintegrated with their families. It is worth noting that the side event organized by IIMA and VIDES International was graced by the presence of the First Lady of Sierra Leone, Fatima Maada Bio. In her intervention, she underscored her personal commitment to collaborate with Civil Society so as to improve the conditions of these girls who end up in prostitution. Likewise, she highlighted the Government’s commitment to ensuring free access to education for all. She concluded with an appeal for support to the international community. After which, Elisabetta Murgia, a representative of IIMA and VIDES, presented the best practices for the reintegration of vulnerable girls which are carried out by the Salesian Sisters in Benin and in India. She showed, in particular, the work being done for the rehabilitation of the Vidomegon girls who are sold by poorest families in the hope of giving them a better life. Unfortunately, today, they have become victims of exploitation and trafficking. She emphasized the practices and methodologies for the prevention and reintegration of these girls in society. Since 2001 more than 4,000 girls who worked in the market of the capital were enrolled in the vocational-technical courses or formal school and were reunited with their families or communities of origin. She also shared the work for children victims of early forced marriages which the Salesian Sisters and VIDES carry out in Tamil Nadu, India. Hatem Kotrane, Independent Expert of the UN Committee on the Rights of the Child (CRC), on his part, emphasized the urgency to address related issues by underlining some obstacles in this sensitive work such as the lack of objective statistical data that gives a clear picture of the phenomenon and the existing legislative measures which are often weak and insufficient to address the exploitation of minors. He stressed the need for greater prevention. He then concluded his intervention by presenting a panoramic view of the situations of the three countries, Sierra Leone, Benin, and India, based on the data collected by the CRC. Federica Donati, Coordinator, Equality, Non-Discrimination and Participation Unit, SPB, OHCHR, underlined that in analyzing the phenomenon of children in street situations it is important to take into consideration that these children and girls suffer the most from discrimination and stigmatization. For this, ad hoc measures for such target group is urgently needed. To close the event, Massimo Bellelli’s message was an encouragement to continue working to help girls who are victims of abuse. Fifteen Permanent Missions participated at the side event, among which were Spain, Montenegro, Iraq, Poland as well as the experts of the OHCHR. They appreciated the work carried out in the Salesian missions and underlined the importance of continuing this commitment. Emphasis was placed on the need of adopting a human rights approach, on prevention, and on networking. Click to read relevant articles from Misiones Salesianas on the side event and post-side event.